Gift certificate of Ala Relaxation Okinawa deep-tissue oil massage. 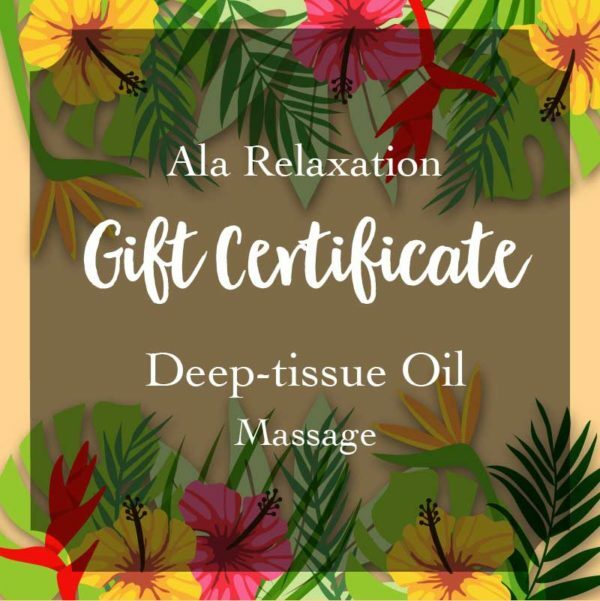 Deep-tissue Oil Massage is a relaxing massage, deep tissue therapy that increases blood and lymph circulation, and reduces swelling in the legs. The rhythmic hand motions and fragrant essential oils utilized in oil massage are ideal for reducing stress and alleviating neck and back pain. This type of massage is particularly invigorating and the benefits linger long after the session. 30 min., 60 min., 90 min., 120 min.